The badge on the Bermudan flag shows a ship (the Sea Venture) foundering on rocks. The rocky coast is shown to the left (as we see it) of the shield, and the sea is to the right. The ship appears to be hitting the rocks. 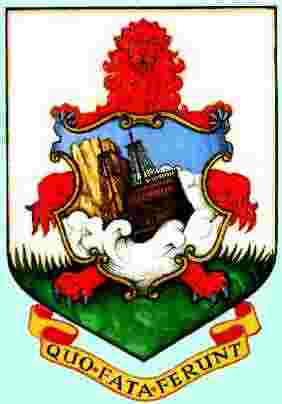 (The Sea Venture was wrecked on the coast of Bermuda in about 1609).The shield is being held from behind by a large red lion, in such a way that its paws appear at the edges of the shield and its head appears above it like a crest. Officially, it's a lion. The Sea Venture Flat is half a mile offshore (not a visible reef on the coastline, as the coat of arms suggests). This was indeed where theSea Venture foundered. But the representation on the crest may have been considerable artistic license based on historical fallacy, not fact. Some historians claim the vessel was actually the French Bonaventura which smacked into an inshore reef more than two decades before the Sea Venture; Others claim it was a Spanish vessel, even earlier, that is (or should be) depicted. Also, at least 6 of the original Bermuda castaways off the Sea Venture remained in Bermuda when the rest of the party sailed to Virginia 42 weeks later. These 6 were permanent residents, holding the place for Britain until the first party of specifically-for-Bermuda colonists arrived in 1612. These 6 were all alive and obviously flourishing when the 1612 lot arrived. I don't think the Red Ensign even existed at the time the Sea Venture founded off Bermuda in 1609. Nor did the Union Jack, as we know it today. The Union flag then extant I don't think had the Irish cross incorporated. It was the 1606 version, I think with just the crosses of St. Andrew and St. George. I believe the Sea Venture also flew just the cross of St. George, as a separate flag. 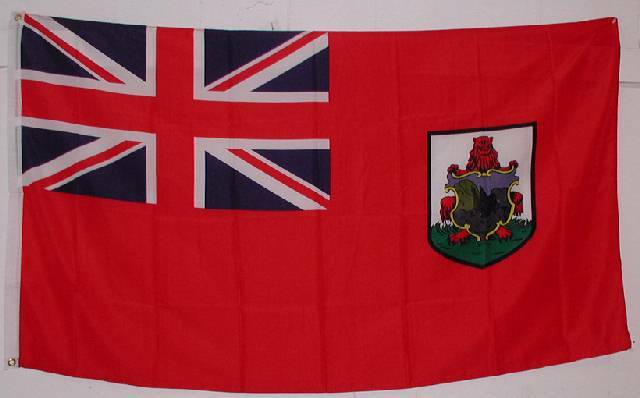 There was an unauthorised defaced blue ensign used in Bermuda before 1910. This was the one that had the '3 ships and a dry dock' badge, replaced by a lion holding a shield depicting a ship wreck. I read that the badge of the Sea Venture was granted in 1915. Then was the flag used between 1910 and 1915 the oldest Blue Ensign? It may be just a coincidence, but 1915 is sometimes given as the year when the defaced Red Ensign became the unofficial land flag of Bermuda. I remain conviced that there have been two versions of the Bermuda Blue Ensign, but I wouldn't argue about the date of use, and/or authorisation of the earlier one. I have a note about the 'dock' badge, which I saw in an early edition of the Admiralty publication, Flags of All Nations. I don't remember which edition but I think either the 1907,1889, or possibly a 1905 amendment to the 1889. I also failed to notice whether it was to be applied to a Red Ensign or a Blue Ensign, but since there is no record of the Admiralty ever authorising a Bermuda Red Ensign it seems more likely that it was for a Blue one. The same design was used on postage stamps of Bermuda between 1902 and about 1910. Under Obsolete Colonial Ensigns, Colours of the Fleet, list; Bermuda (-Blue) pre-1910, and under Blue Ensign -defaced - Dependent Territories Bermuda (new design 1910), with a note about the Bermuda Red Ensign having been the unofficial land flag since about1915. I am in a position to confirm the old colonial badge of which there is a reference in the Bermuda Library. It actually contains the official Coats of Arms for all the British Colonies for 1910. It is printed by His Majesty's Stationary Office in 1910. The badge should be a lot larger to follow the current specs. I've never seen the Governor's Flag so I'm not sure if it just uses the shield, the shield plus motto, or the full achievement, complete with supporters. The badge listed as the former colonial badge is actually the present. I am still attempting to get a scan of the old badge for you. It is in fact a sea scape of sorts with a couple of rum barrels on a jetty if I remember correctly.The book of which I speak is called "Flags, Badges and Arms of the British Dominions beyond the Seas" printed by H.M.S.O. in 1910 [hms10]. I am trying to negotiate with our local library for access so that I can scan the whole book. It gives a very good "snapshot" of the British badges from the early 20th century . The original badge, introduced in about 1875, was derived from the seal of 1817. It shows three ships at sea in the background and a wet-dock, with gates closed, in the foreground. The current badge replaced it in 1910. According to the display catalouge of the flag display in ICV 19 (York, July 2001): "Bermuda uses the red ensign with its badge on land. The badge shows the wreck of the Sea Venture, the ship that provided the early British settlers. The ship was wrecked on a submarine reef, not dashed against cliffs." The motto on the scroll "Quo Fata Ferunt" means "Whither the Fates carry [us]". James Dignan pointed out that the images we previously had of the bermuda flag (see: Badge with a "Puddle") show the red lion affronté holding the shield, with what looks like a small pool of water below the shield, while there is no such puddle on the badge. The current Edition of BR20 doesn't show any such puddle, neither does the change number 5 nor change number 1 to the previous Edition, and BR20 (does after all) set the official standard. Not that this is in any way definitive but just as a matter of interest, a quick glance at Znamierowski (1999), Pedersen (1970) and the Flaggenbuch (1939) doesn't show any pool either. It would thus appear that there should be no water below the lion's feet on the current badge, and evidence would strongly suggest that there never was (at least officially). Pedersen (English edition, 1971) does show a blueish discoloration, probably a printing error. The Dutch edition of 1980 does show the blue puddle clearly (In my opinion, the puddle should be made green). The flagchart of Shipmate of 2002, authorized by the Flag Research Center, does show the blue puddle. Pedersen does show a slight discolouration but I thought that it was meant to been shading, and given the other official sources I quoted it looks like flagchart and Flag Research Center did make a mistake. I personally thought the puddle was a result of ocean water leaking from the shield that the lion is holding, but that's neither here nor there. I have 2 "official" Bermuda flags, neither of which look exactly like anything I have drawn or I have seen drawn. I reckon they are, as they say, close enough for government work. The "official" image that Christopher Southworth sent shows a bluish ocean in the smaller shield. I have not seen another image anywhere with a bluish ocean. Everything I have seen along with all of the Bermuda flags at my disposal have a foamy white ocean driving the ship into the rocks. The 'puddle' appears originally to have been shading in the grass (?) compartment. Here are image from Flags of the World 1915 by W.J.Gordon and image from from Flags of Maritime Nations 1914. There are images showing the ocean blue, including that used by the CIA Factbook, but they are far outnumbered by those showing it white. 1- The small coat of arms on the Government of Bermuda's homepage shows the ocean white. See <www.gov.bm> -very small, but the ocean is clearly white. 2- Photos of actual flags show it white, e.g. <www.limeyinbermuda.com>, <www.donkihote.com> and <www.painetworks.com>. I did find a variant that, if the color is not distorted, shows the ocean gray at <people.cedarville.edu>. 3- A Bermuda stamp at <seaside.hfxns.org> shows the arms with white ocean. The image in BR20 (with a blue ocean) is the official image to which all others should theoretically conform, however, unless the official blazon (assuming such a thing exists) stipulates the actual colour/colours of the ocean then heraldically speaking there is no reason why it should not be white, blue or grey depending upon interpretation. My own spec was altered recently to conform to the official image, but Change Number 1 to the previous Edition showed a beige-grey ocean which adds yet a further complication. Earlier, I had suggested giving priority to the version with white ocean rather than the "official" version with blue ocean, unless we had evidence the blue ocean version actually existed. Well, we can rest assured that it does, thanks to photo at Ebay. National guidelines and regulations for the use of the Coat of arms are at "Visual Identity Programme Policy and Guidelines".